First swarm of the year. Really, first swarm of my life. To think I started this endeavor just over a year ago, hiving my three hives on April 19, 2015. Now the little buggers (literally!) are going off on their own. 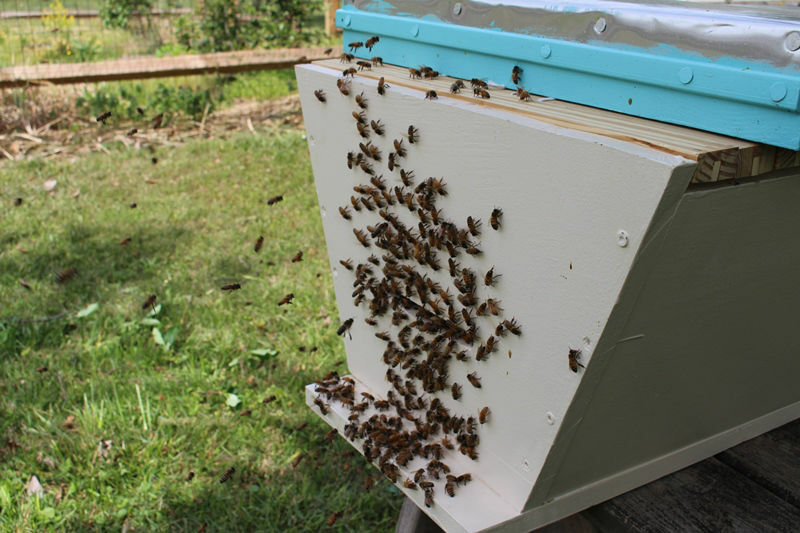 I remember when they were just a little nuc box, eager to grow into a full-sized hive. In my last post, I was recovering from a cold and about to travel across the country. I tried some desperate measures to keep the hives from swarming, which I suppose worked in its own way. Here we are two weeks later and I just happened to take a stay-cation the day the bees swarmed. A month ago I knew I would need a day off to stay home and putter around the yard, so put in a request for time off today. The quick story is that I checked the bees yesterday April 24 and was preparing some additional actions in hopes of keeping the bees safe and sound. Then the swarm appeared, and I spent the afternoon hiving them in my new top bar hive. The details are so very exciting. I’m not certain if the original Jupiter or Mars issued the swarm. I think it was Jupiter, maybe? This hive was happily creating a couple dozen queen cups when my helper G and I checked them on April 2. In hopes of preventing massive swarming, before I left for California (on April 11) I set the bottom deep up as a new hive, and added a medium to the old hive (so it was then two mediums). Both boxes had capped queen cells, and with no idea where the queen was it my best option on short notice. It turned out the buzzing I heard was some very active bees. A swarm! So I’m guessing the queen was in the original spot (the two mediums) and decided to swarm. Today was our first really warm day since I left, in fact, so that might have something to do with it. I was checking the pool and heard this loud buzzing. 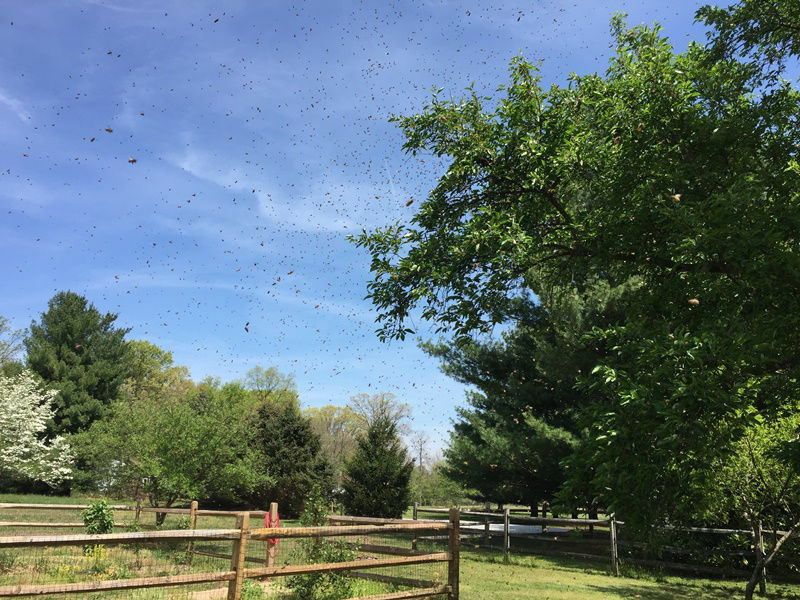 I went to the side yard, and the sky was full of bees as in the picture. 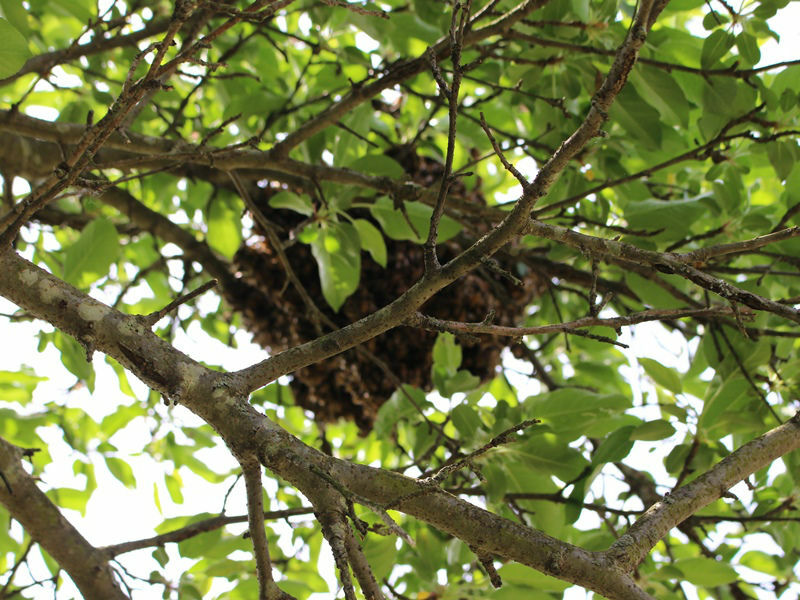 They were gathering on a branch in the tree next to the bee yard, about 15 feet high. The prior day I was trying to figure out how to get bees into my new top bar hive. The 19-inch bars are longer than my existing hive (14 inches), and I had trouble transferring comb from one to the other on April 11 (basically the comb fell apart). So it was rather fortuitous that I was home from work for the day and had a hive body to spare. I cleaned out the hive and set it under the tree, eventually deciding to put 10 bars and the follower board at the back of the hive. The plan was to cut the branch down, bang the bees into the open space, and slide the bars over. 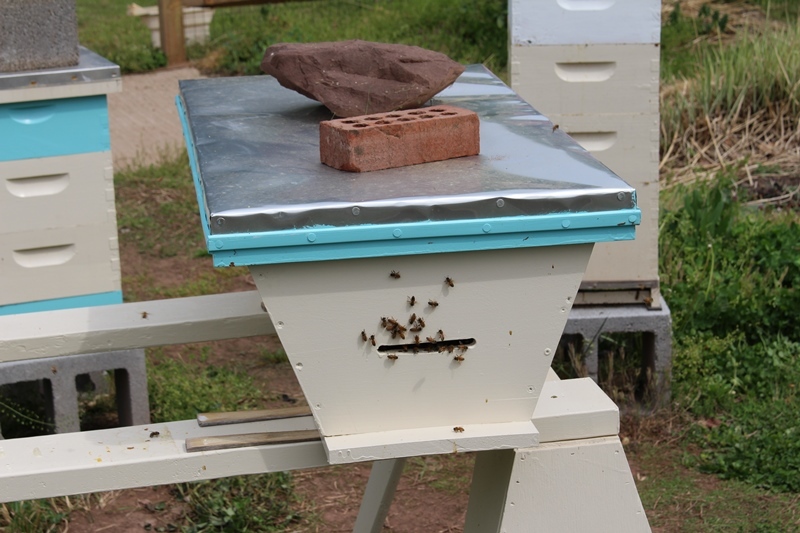 You can see my prepared hive in the picture here, with the single comb I successfully attached two weeks earlier. I added another bar not shown here, a 14-inch bar tied onto a flat bar for the new hive. The comb on the existing bar had broken, and I thought the bees might appreciate having some starter comb. In theory comb and the smell of honey encourages the swarm to stay put and not seek alternate accommodation. Climbing our step ladder, I was just tall enough to cut away some surrounding branches. The swarm branch was too big for my loppers, and too awkward for a manual pruning saw, so I eventually grabbed my cordless saw (with thanks again to Prospect of Bees) and cut just over halfway through. I expected the branch to fall and erupt in a cloud of bees, but much to my surprise this did not happen. I pulled the branch off and lifted it over my head so I could climb down the ladder with the swarm in hand. A friend with a camera would have been great, as I would love to have a picture of me holding a swarm of bees. 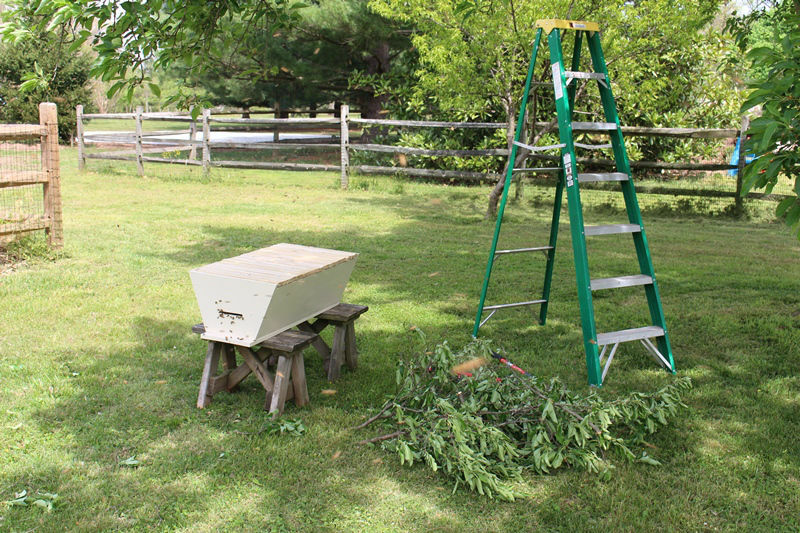 Instead I banged the branch over the hive a couple times and the bees dropped inside. As long as you capture the queen, the rest should follow. After sliding the bars over, I had a new hive. I added more bars to the back, eventually snapping the picture here showing the ladder and branches (with my sincere apologies to the tree). I had called fellow beekeeper Karla, who lives just down the road, in the middle of my swarm capture. I wasn’t sure if I should wait for the swarm to settle or capture it as soon as I could. She shared that some swarms have a spot picked out and take off in an hour, and others stay and ponder for a few days. You have no way to know which type of swarm you have, so she advised capturing it right away. Once I had the hive, the next question was when to move it into the bee yard. On the one hand the swarm needed a chance to definitively select the hive; on the other waiting too long would risk some forages orienting to the hive. I let the hive sit for an hour, and then carried it inside the fence (amazing how light a hive is with barely any comb). Hopefully not too many bees were lost in the transfer. After the prior day’s inspection, I also placed the hive so it faced to the back (somewhat westward). The advice is to face a hive southeast so it captures the morning sun. Facing east would put me in front of the opening every time I checked Mars or Jupiter, so west seemed a more prudent option. The new hive at its new home. Facing west, in spite of conventional wisdom. Whew! After all that the rest of my day’s activities seem rather mundane. Later that afternoon I placed a new medium super on top of Jupiter’s two existing boxes. The second medium I’d added two weeks earlier was fairly full already. Our new one-deep hive was bursting with bees yesterday. I decided it doesn’t get a name until I see some larva inside to indicate an active queen. To keep them busy, today I put in a deep foundation-only frame. I removed an old plastic frame that I’d received in the original nuc. It had wonky comb and was full of nectar, so was glad to remove it. 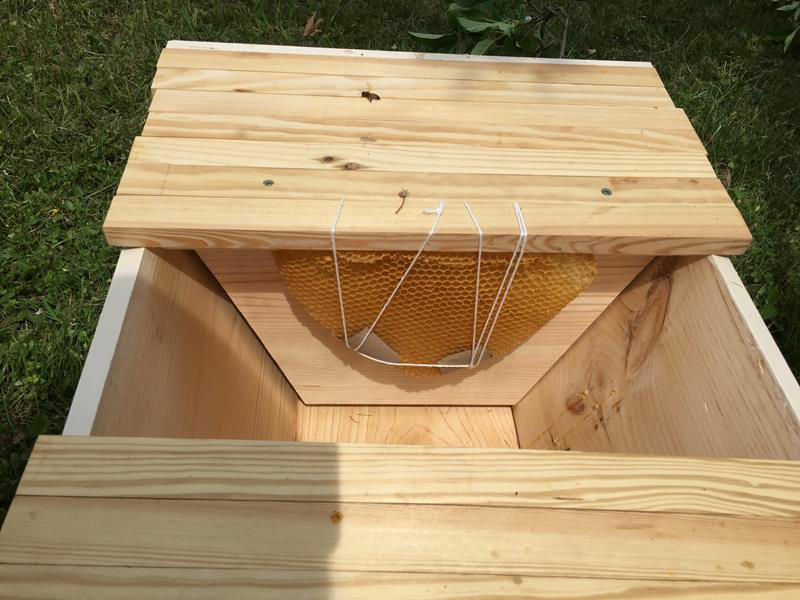 I set it in a box just outside the bee yard so the hives could gather the nectar. Presuming my budding honey factory didn’t issue the swarm, this hive is doing great. I did find one queen cup inside the prior day, which is why I wonder if it might have swarmed. The extra medium I added two weeks earlier was near full, so this hive also received another medium box full of foundation frames. I also tested for mites in this hive (yesterday, using the sugar shake method) and found a count of 11 mites per 300 bees. Given our warm winter and early spring Karla had predicted an early mite buildup. The recommended threshold is 2% to 3% (6 to 9 mites), as over this amount the bees are more likely to pick up viruses and other diseases. So I needed to deal with the mites. I prefer Randy Oliver’s recommendation on scientificbeekeeping.com to use a knockback treatment approach of a single MAQS stip, instead of the recommendeded knockout treatment of two strips. It is easier on the bees and still fairly effective. So today I inserted a single MAQS strip above the brood chamber. The strip has to stay inside for seven days. Formic acid (the active ingredient) occurs naturally in honey so you can apply this treatment with the honey supers on. Our existing top bar hive seems to be doing well. There are roughly 8 frames of brood in the middle of the hive, with nectar and honey frames in front and behind. I did find a single queen cup, though only one. As far as I know the hive still has the original queen from the package I purchased last year, so it could be a supersedure. I inserted a couple empty bars to keep the bees busy building comb. I checked the mites in Venus yesterday as well. A month earlier it had a mite count of 4 per 300 bees, or just over 1%. This month the count was 9 per 300, or about 3%. The MAQS strips come in packs of two, so I placed the second strip just inside Venus’ observation window. This puts it right in the middle of the brood nest. While I can’t seem to avoid crushing bees when shutting the window, it sure is easier to open the window and drop in a,strip than lifting off the cover and opening up the bars. 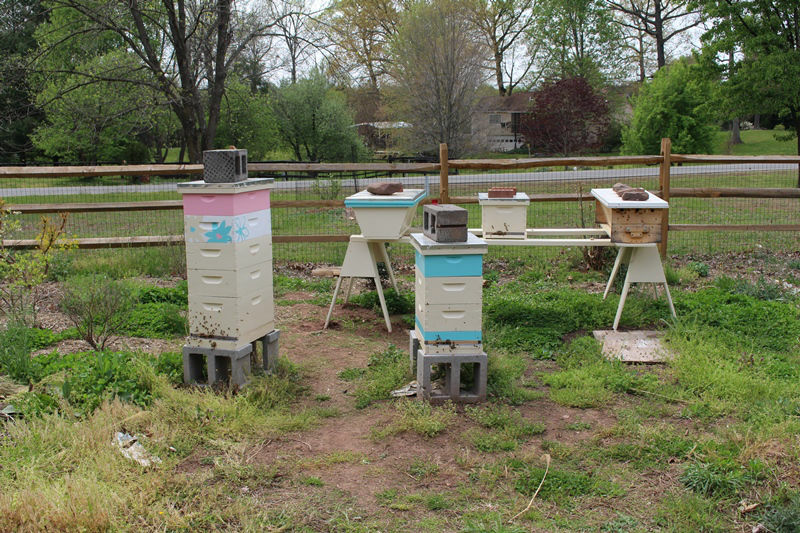 The updated bee yard, with Langstroth hives Mars (pink top) and Jupiter (blue top) in front, and the new top bar hive and new Langstroth hive in back, with Venus in back on the right. The advice I have seen is to leave a captured swarm alone for a week, although watching the entrance is permitted. I expect to check the entrance often. Our title today comes from this familiar bird quote. According to my new reference book A Dictionary of American Proverbs as well as the UK Phrase Finder site, this proverb first appeared in the 1545 work The Rescuing of the Romish Fox by William Turner. People with similar ideals or habits tend to associate, or flock, with other like-minded people. Since birds and bees are sometimes presented together, this seemed to be a good basis for this post on my first swarm. Also, of course, only bees from the same hive swarm together, so it fits. Although bees don’t actually have feathers, so the comparison only goes so far.